Quebec City, the historic French-Canadian town, draws in all kinds of tourists looking to bask in its European charm and deliciously creative cuisine. I recently visited, but before that, I was sure to do a ton of research on where to eat and where to go. 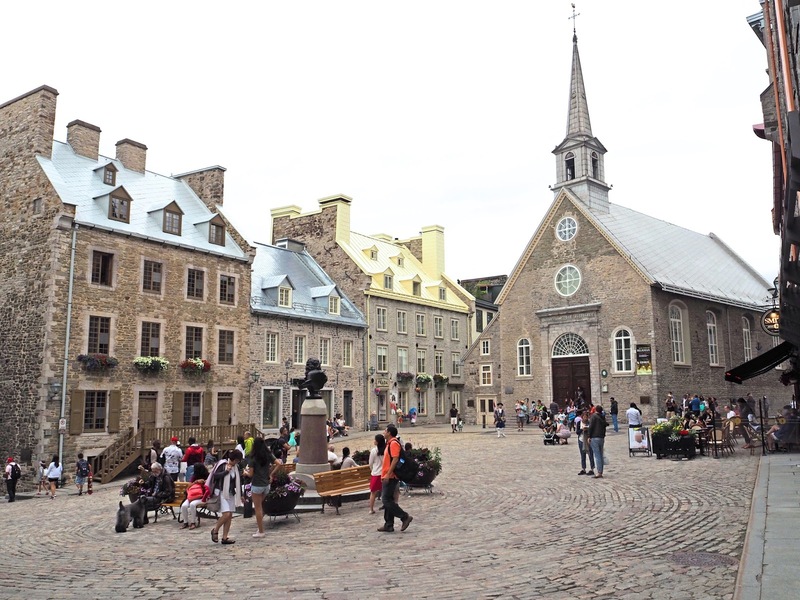 Quebec City is relatively small, so you can pretty much cover it all in 12 hours, unless you plan to go into museums, as there are quite a few, but not every one will pique your interest. If you're planning to head into Quebec City, here's a 12 hour guide for spending it in order to make the most of your time there, hitting all the most beautiful spots and eating at the most delicious restaurants. Everything in Quebec City can be seen by foot, all you need is a camera and some nice walking shoes. In fact, Quebec City is full of walking tours, that's basically what tourism is here, so seriously, these better be great walking shoes. 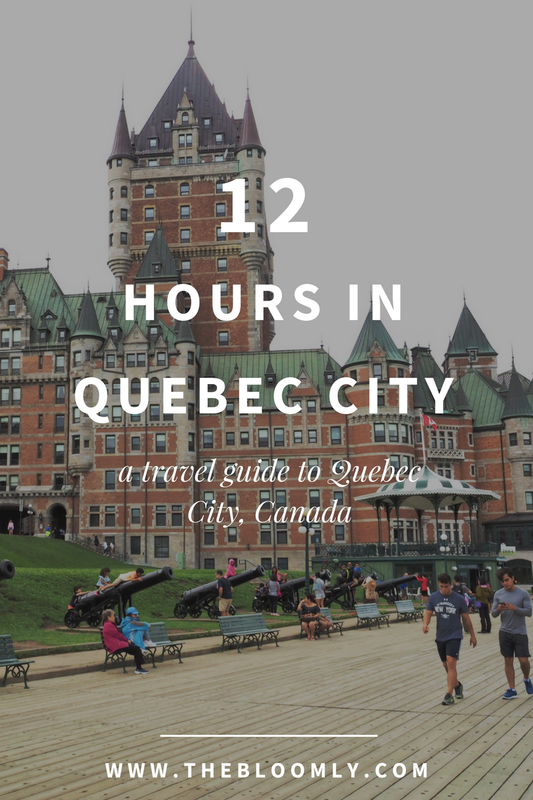 While this 12 hour guide is very structured, there are also substitution suggestions based on your tastes of what to do, combining my personal experiences in Quebec City with research from other travel guides. Paillard has everything you need, from flaky and buttery croissants to icy cookie dough ice cream. Paillard is busiest at breakfast and lunch, they offer a variety of soups, sandwiches, macarons, homemade breads, cakes, and more. However, for breakfast, I would suggest opting for a simple croissant and a coffee. In fact, Paillard was named winner of the Quebec City best croissant contest in 2010. But if croissants aren't your thing, there are always macarons. Maybe they're not necessarily traditionally breakfast, but it's great to treat yourself from now and then and this can be one of those moments. The Place de l'Hotel de Ville is a town plaza surrounded by historic buildings and statues. In the center, is a fountain that lights up. There are often events and activities located here, but it depends on the time and day. In this small street of Rue du Tresor, there are lots of artists selling their work, most of which display different scenes of Quebec City. You can walk through and simply enjoy looking at the art, almost like in a museum, but you can also look at the art as a prospective buyer. The art is relatively inexpensive (art is expensive as is! ), with tax included in most of the prices but it varying depending on the artist and the medium. In addition, I'm pretty sure that the art being sold is all original. I actually ended up purchasing a trio of scenes of Quebec City and I'm pretty happy with it. Located just by the famous Château Frontenac is the Place d'Armes, a small park area with a fountain in the center, surrounded by the hotel and various restaurants. There are benches by the fountain and there are often street musicians playing all kinds of music. Milkshakes in mason jars, chalkboard coated walls, and fun mismatched lights will greet you at Le Chic Shack. Located in the heart of Vieux-Quebec, Le Chic Shack will charm you with its creative burgers, poutine, milkshakes, and homemade soda. They don't take reservations, but if there's a wait, it'll be quick. They have quite a variety of burgers, from classic beef to bison and lobster and even vegetarian options. While the burgers are small, you can fill yourself up on fries and poutine. While poutine is not my cup of tea, people rave about poutine, so I think that it's worth trying. Le Chic Shack has the simple poutine, but also has some creative ones, such as masala poutine and poutine with beef and horseradish aioli. In addition to the creative sides, you can fill yourself up on sweet milkshakes or homemade soda. They don't carry any commercial sodas, but instead make their own using 100% fruit based purees. Substitution! If you want to eat a heavier breakfast and/or burgers at Le Chic Shack aren't your thing, save Paillard for lunch and eat a delicious sandwich. 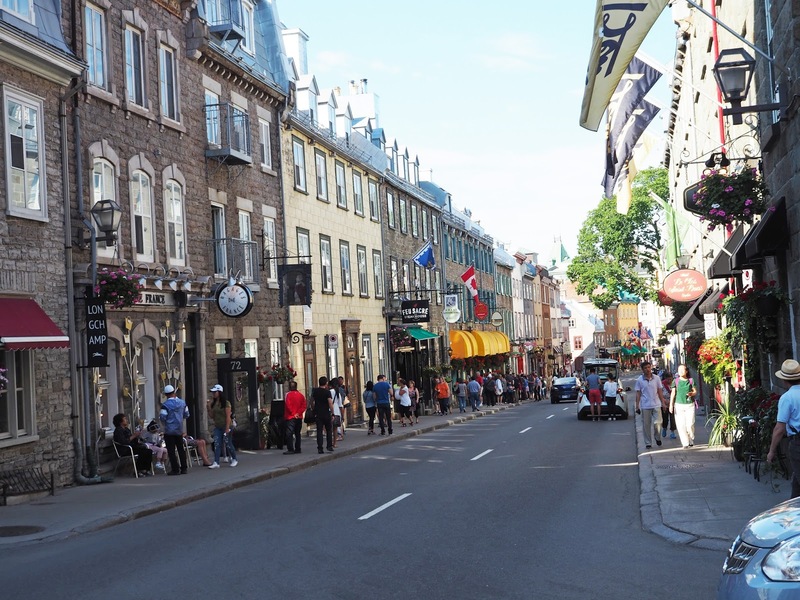 Quartier Petit-Champlain is the home to all kinds of shops and restaurants. From creperies to moose-themed gift shops to kitchenware stores, there are so many different shops to weave in and out of. The shopping center makes you feel like you're in a narrow French street, the cobbled streets and window boxes of flowers, there are definitely some Instagrammable moments here. 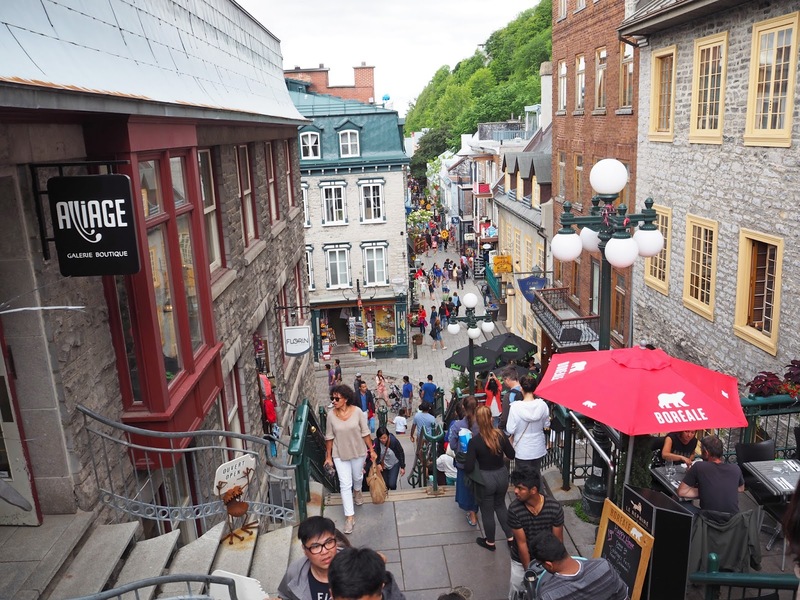 You can get down to the shopping area by the Funiculare, which is a cable car that moves down from the upper area into Quartier Petit-Champlain, or you can head down the stairs, known as the Breakneck stairs, but honestly they do anything but break your neck. With only 59 stairs, it's really not much of a feat. Like the Quartier Petit-Champlain, Place Royale feels like a cute little town square. Although Quebec city has French influence, it reminded me of Rothenburg in Germany, having a church and a little square with some small restaurants. It's practically picture perfect. There's also a huge mural in the area and it's so pretty. The mural, called La Fresque des Québécois is located on the wall of the Soumande House on Notre-Dame Street. It features some of Quebec's notable features and celebrates cultural diversity of immigrants. Maison Smith is a simplistic cafe that has it all. But the best thing about this Maison Smith in Place Royale is that it has everything you need, ice cream, coffee, pastries, but there's also great outdoor seating that's perfect for people watching right in the middle of the square. The inside is cute and you can probably get some great 'grams, but it's so much nicer (in the summertime) to grab and iced coffee and sip it outside while people watching. 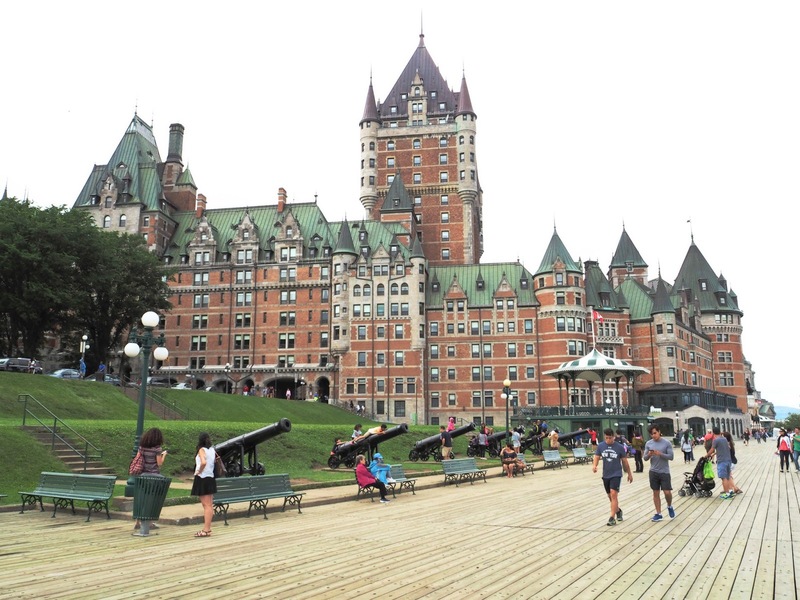 The Dufferin Terrace is a long walkway in which you can get a nice view of the Château Frontenac, the picturesque hotel that you might think of when you think Quebec City, and also the St. Lawrence River. Go for a nice walk along the terrace, snapping pictures of the river and the hotel. Located on the Dufferin Terrace is staircase that will lead you into the past. A quick 15-20 minute breeze-through will allow you to check out the whole site. For a dose of history, you can check out the archeological remains of the Saint-Louis Forts and the Château that was formerly the residence of the French Governor of New France and later the British Governor of Quebec, the Governor-General of British North America, and the Lieutenant-Governor of Lower Canada. Throughout the center, you can see the kitchen, refrigerator area, and more that the servants would have been in. In addition, you can see information about the evolution of the Château and how it was added to over time, eventually leading to its destruction via fire in 1834. While the St. Louis Château was being repaired, the governors split their time between St. Louis and the New Château (Château Haldimand), which is now where the Château Frontenac hotel stands. From the Terrace to the Citadelle, there's a quieter walking path connecting the two, the Promenade des Gouverneurs. From there, you can see the St. Lawrence River and the back of the Citadelle. Enjoy a casual stroll and nice scenery. The Parliament Building (Hotel du Parlement) is an important historical site of Quebec City. Its architectural style has the popular Second Empire architectural style, and by popular, I mean that it was popular for the important buildings in Europe. Basically the who's who of European buildings. Outside the Parliament, there are 22 statues of well-known people to Quebec's history. Snap some pictures of the building and check out the surroundings, enjoy the fountain, you know, enjoy yourself. More French-like architecture and narrow streets! Rue St. Louis is no exception. Take some snaps of the European charm while working your way back towards Place d'Armes for dinner. If you get to the restaurant before 8 PM, you can enjoy some street musicians, there are often musicians out there in the summer by the park. In addition, near the Chateau Frontenac and the Dufferin Terrace, there are often performers, jugglers, magicians, etc. out there, especially at night. Enjoy the free entertainment before dinner, but otherwise you can take your time strolling down Rue St. Louis. Chez Jules, formerly known as Le Pain Beni, is a French restaurant located at the heart of Vieux-Quebec. It carries the same charm as the brasseries in France, despite the fact that it's located in North America. Chez Jules carries the French classics without ever having to venture beyond the Atlantic. 12 hours isn't much and although this guide covers the famous spots, there's still more to see in Quebec City. Here are more notable spots in Quebec City that are worth a visit if you have more time.